A few weeks ago on our second trip of the year we headed to the Ballyhoura Mountains which was perfect in many ways in that it was not that far away especially at this time of the year and the fact we were walking for the most part on Forrest roadways. The day itself was cloudy, windy and mucky but we as usual made the most of it and got on with it and enjoyed the day. We parked in the Coillte ran car park, we departed by going back out onto the road & on back southwards for a small bit before we turned left down a small country road facing out towards the Galtees in the distance before we looped onto the main road again before crossing onto the mountain side again using the Forest roadway along the way. There was one steep section of this roadway but other than that it was a great walk for a February Sunday morning. 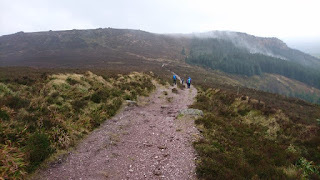 Once we reached the top of the roadway we took a short stroll to go to our first peak which faced out towards Tipperary & Limerick but the view was cloudy and not really much to take note of because of this. We moved on and over the road and we decided to head for the top of Seefin Mt. and compliments must go out here as Timber Sleepers have laid to overcome the one really mucky part of our journey. When we reached the top the one thing we noticed was that the wind had picked up & with it a big chill factor with the blow. We had a short break before we set on our way again. We descended using the Mountain tracks which are well waymarked, the one thing to watch out is that some are for bikes only and we finally got back through the Forest back to our cars.